About $63 million in improvements are slated for Jacksonville’s EverBank Field, host site of the Georgia-Florida football game. The improvements include a reconfiguration of the north and south open ends of the stadium with giant video scoreboards “among the largest of their kind in the world”, a “party deck” fan pavilion, and even a water feature. The work is expected to be done in time for the 2014 NFL season. While the new video boards will be a welcome improvement for Georgia and Florida fans, the biggest change will be to the seating in the north endzone (opposite the river.) 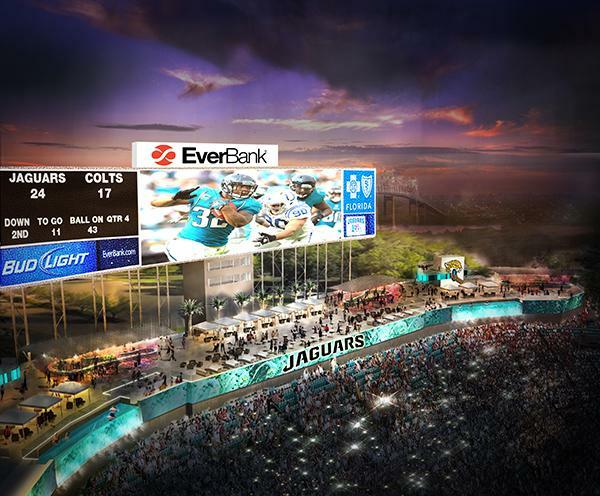 According to Jaguars President Mark Lamping, the project will require the removal of nearly 7,000 permanent seats in the 200 and 300 levels to build a platform that extends out over the lower-level seats. These seats to be removed are usually tarped over for Jaguar games but are needed for the Georgia-Florida game. To account for the lost seats, the stadium will remove temporary structures from the new platform and put up 7,000 temporary seats for the Georgia-Florida game, similar to those temporary seats currently used in the south endzone sections.